I would say it was caving or Spelunkin more than trekking. This synonym of caving was added to my dictionary by Anu, thanks Anu! So i'm out of my house with an umbrella and warm clothes wondering how the unpredictable Bangalore weather can just throw one's life out of gear in a sec! To add on to my fowl mood, i got splashed by a car which drove over the puddle as if the driver offered me a free water ride. I somehow managed to reach the meetup point. Our transport for the day was a tempo(?)!! I was surprised to see the founders of the BTC family :-P (Viru, Chaitanya) standing right infront of the tempo to welcome their old kids, small kids and newborns!! I hadn't expected that i would meet them so soon,(i had heard a lot about them in the last trek). Feeling glad about it i get into the mini bus and took my seat. Unexpected rain had obviously stretched the plans for the day, so we could not leave at the planned time. We picked up Channa at Okalipuram and in no time i got to know his petname "Chandala". Rhymes well with Khandala :-P! All in, head counts done and we hit the NH4 Tumkur road. It was time for BTC mania to kick off! Sangamesh, host for the day introduced us to a game of singing (To sing a song from the last vowel/consonant of the previously sung song). It was a juke box! retro, contemprory, pop, national integrity songs, you name it you've got it! To the conventional music genre list an addition was Bollywood item numbers! The guys sung them so Dil Se, now i know why Indian movie directors consider an item number on par with the actual movie :-P. By 9ish we reached Dabbaspet, our first stop for energy loading. We had thatte idli with vada, sipped coffee, bantering amongst groups went on. (We were a good number of 20!). Took food parcels for lunch and we were back on the road to reach our destination. Wow, now everybody seemed like those duracell battery charged bunnies! The bus seemed like an unstoppable Orchestra wherein all the members had transformed themselves into musical instruments. It also did remind me of Indian Idol auditons, every member with equal potential of blossoming into either Sonu Nigam/Shaan/Kishore kumar the list goes on! (Don't take it too serious guys! i'm referring to those funny auditions of chaps who get kicked out by the judges) Unfortunately we girls were overpowered by their exceptional voices :( Our new talent for the day was Sri, who can give competition to Javed Akhtarji. His Chakka Chakka charkha chale was unanimously chosen as the best song for the day! (Nope! i haven't got the lyrics wrong, its chakka not chappa). To give rest to our vocal cords we proceeded to play dumb charades. That was again another mind blowing session, it seemed like members made up fake movie names at that instant! Personally i feel Amitesh deserves to be awarded Mr. Dumb charade for his graceful bajji/pakora/paddu making demo! We laughed till our stomach hurt. Maybe around 11 we reached Siddara Betta. We begin the trek, this trek was unlike the other treks where you are amidst the nature with no other company, this place was flooded with people who come to visit the Shiva temple located up in the hill. This place was like any other tourist spots with many shops selling pooja stuff, water bottles and soft drinks. Just like Vodafone network, wherever you go the monkeys follow! The boulders upto the hill top had man made steps. If you thought climbing laid down steps was easier than the rocks, believe me its not! I was almost out of breath, panting heavily just after climbing about 50-60 steps. Viru and Sushma were kind enough to offer me medical help :-P. Everybody climbed the steps at their own pace, chit chatting, resting now and then on the way. I need not mention about Photography, (Pro's: Santosh, Chaitanya, Channa, Sangamesh, Madhuri, Vijay, Pavithra, Arjun, Anu) which was a full fledged mission in action from the start till the end! After some energy loading it was the photo shoot time. Santosh was trying his pro skills and his models were Channa and Sangamesh! After ample amount of time we decided to descend. Took group photos and couple of pics along the trail and began to trek down. Santosh helped me to stuff more lemongrass in my bag as we descended. 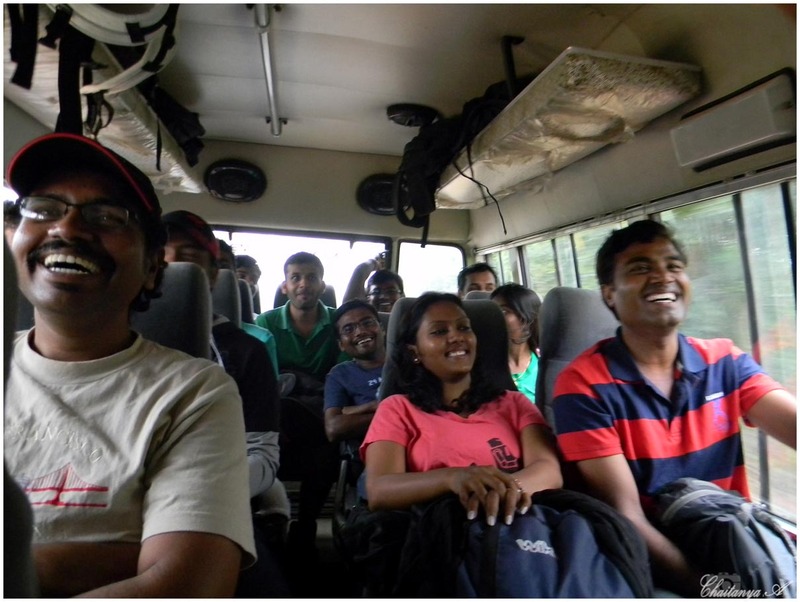 All of us boarded into the bus and started back to Bangalore. We stopped by Koratagere to have refreshing masala soda and also had the feedback session. The organizers shared with us the history of BTC, after which my fondness for BTC grew all the more. We were back in the bus and continued our journey. Dumb Charades continued and which was followed by singing of old ad songs, Nirma washing powder, Vicco turmeric to name a few! The outstanding performance for the day was delivered by Sri and Vivek singing Spiderman song. In an hour time we hit the nice road, were in the city. Couple of us got down at ORION mall and walked back to our homes with a new set of memories to cherish! 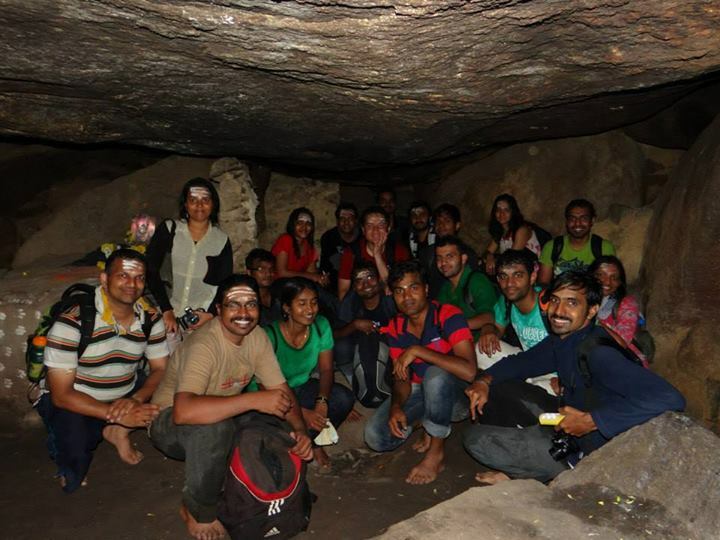 It was yet another fun filled (actually fun overflowing), well planned and executed trek!